Forests are dynamic ecosystems that change in character naturally over time yet continue indefinitely unless catastrophically destroyed. Plant ecologists and foresters call the natural maturing of forests and its concomitant shift in tree species composition forest succession. Natural forest succession is a constant, continual, predictable change that all forests undergo over time. 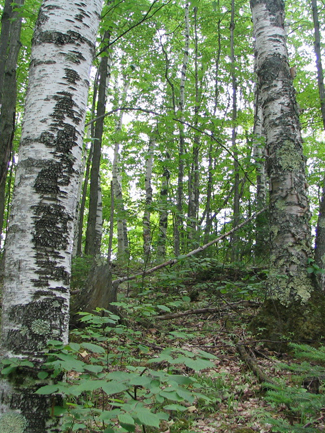 Woodland practices of professional foresters, silviculture, mimic this natural process to accelerate, maintain or decelerate these natural rates of succession in order to achieve specific landowner desires for the forest. These ownership goals may be more wildlife habitat for songbirds or habitat for game. These goals may be ski and hiking trails or maple sugar products or high-quality sawtimber production. No matter the goal, silvicultural work that affects the composition of the tree canopy and its understory can have impacts on the forest that last many decades. For this reason, forest management planning and forest plan-making are paramount, essential activities. In a forest stewardship plan, descriptive information about a land’s biotic and abiotic resources is compiled and given in detail. Also in the plan, the vision and objectives of the landowner are recorded; the activities proposed for the forest are clearly stated; the timeline for all activities on the land by all parties is drawn up; and the activities are mapped for the property. Forest stewardship plans are so important that all cost-share and grant programs for forest owners require first that forest management plans be developed. We have many decades of experience in producing forest stewardship plans in conjunction with landowners. We are long-trained and multi-certified for the following programs: Wisconsin MFL; Wisconsin Forest Landowner Grant; Michigan Forest Stewardship Program; Michigan Commercial Forest, Michigan Qualified Forest; USDA Natural Resources Conservation Service EQIP; and American Tree Farm System. Should you be interested in applying to any of these programs, we are certified with the American Forest Foundation's Tree Farm System (ATFS). We are Certified Plan Writers for the State of Wisconsin and the State of Michigan. Also at the state level, we are certified Wisconsin Master Naturalists. Lastly, we are federally certified as Technical Service Providers (11-7505) with the US Department of Agriculture. We have more than thirty years experience in forest and wildlife inventory, reconnaissance, mapping, analysis and reporting.